A new school year means another session of preschool co-op at our house. We get together with a couple of other families in the neighborhood and each of the moms takes a turn teaching. It’s a great way to make friends, and for the kids to have an opportunity learning from people with different teaching styles. This is our fifth year doing a preschool co-op as part of our home schooling, and we’ve really enjoyed it. Recently when I hosted, we learned all about shapes. We started out with a gathering activity. I brought out our sets of Wedgits and Magna-tiles, so the kids could explore building with shapes as they arrived. Once everyone was there we sat in a circle on the floor, and I handed each child cut-outs of the four basic shapes; circle, triangle, rectangle, square. We talked about each one, and said how many sides and how many angles it had. Then I would describe a shape by saying something like, "I'm thinking of a shape that has three sides and three angles." And the kids would have to hold up their triangles. When the kids had the basics down pretty well, we talked about how shapes can be different sizes or colors but if they have the right number of sides and the right number of angles they are still a square (or whichever shape). We played a game where the kids came up and picked shapes of different sizes and colors out of a brown paper bag; they had to decide which shape it was, and then put it on my flannel board under the right category (circle, square, triangle, rectangle). Then the kids needed some wiggle time. We went outside on the driveway where I had drawn large shapes with chalk. We walked around the perimeters of the shapes singing Hi-Ho the Dairy-o and changing the words for each shape, like this: "A rectangle has four sides, a rectangle has four sides, two are short and two are long, a rectangle has four sides." Then I gave the kids chalk and they practiced drawing the four different shapes. For a snack I gave them pretzel sticks and had them try to make their shapes out of pretzels too. After snack we did a cutting/gluing activity. They attempted to cut out the shapes and glue them onto another piece of paper and then color them. Depending on the age and skill level of your preschoolers this activity might be really easy or really hard. My four-year-olds did great, and my three-year-olds struggled. An alternative to cutting might be to cut out the shapes on cardstock and use a hole-punch to punch holes around the perimeter, then tie a long piece of yarn to one of the holes and have the kids “sew” around the shapes instead. For our last activity we did pattern block pictures. Each of the kids got a cookie sheet, a pile of magnetic pattern blocks, and a laminated picture to fill in. You can find lots of free pattern block card printables online, just Google search “free pattern block printables”. The kids seemed to really like this activity, and when they finished with one picture, they asked to switch out for another one. We worked on these until it was time to go. I sent each child home with a bag full of paper shapes, colored sticks, and a piece of string. 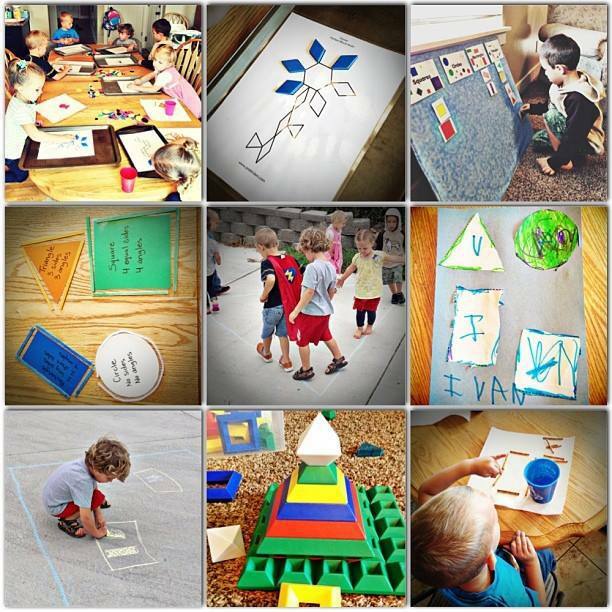 If they want to practice their shapes at home, all they have to do is set out a paper shape, pick out the sticks that match the color of the shape, and then use the sticks to frame the outside edge of the shape. The string is for the circle. We had a lot of fun doing shapes preschool. A few of my ideas I found on Pintrest, a few I came up with myself, and a few of them I found in this cool book called Getting Into Geometry put out by the AIMS Education Foundation. It’s a fun book with all sorts of activities that teach 2D and 3d shapes using all the senses. One of my favorite ABC books is Chicka Chicka Boom Boom by Bill Martin Jr. and John Archambault. It is simple, colorful, and rhythmic, and my kids have a blast with it. We’re doing ABCs for preschool again this year, focusing on a different letter each week. But first, as an introduction to the alphabet as a whole, I’m going to start our year off with a Chick Chicka Boom Boom unit. And I wanted to share some of the ideas we used last year that were successful. My boys seem to interact better with a little bit of visual stimulation, so when I make a unit study like this I usually try to incorporate some sort of a bulletin board aspect that we can leave up all week long while we do the different activities. For Chicka Chicka Boom Boom, I made a large palm tree out of construction paper, laminated it, and taped it up to the side of the fridge. Each day as we read the story together, the kids pick up magnetic letters out of a pile on the floor, and have them climb up the coconut tree. I’ll admit their favorite part is to knock them all off when the tree gets too heavy. In the story, it is the lower case letters who climb the tree, and when they come crashing down, the capital letters come rushing to the scene to make sure everyone is all right. This part of the story provides a great opportunity to do capital/lower case letter matching. We used our letter magnets and put up all the capitals on the fridge in alphabetical order. The kids took turns drawing a lower case letter out of a bag and then matching it with the right capital. Sometimes, I like to throw a little drama into the mix, and Chicka Chicka Boom Boom is an easy one for the kids to act out. 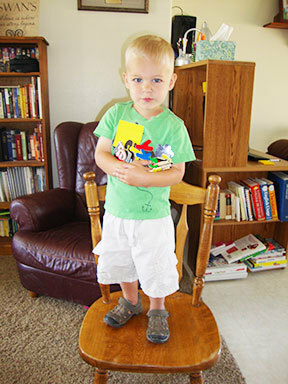 The kids took turns standing on a chair pretending to be the coconut tree. Whoever was not the coconut tree would find the appropriate letters as I was reading the story, and hand them up for the coconut tree to hold. In the end the coconut tree gets too full and all the letters come crashing down. Then the kids switch places and we do it all over again. Anyone that knows me, knows I’m a sucker for handprint art projects. My kids get a kick out of them too, and so we can make handprint art out of almost anything! Coconut trees are no exception. All you need is a piece of card stock, green and brown poster paint, and some alphabet stamps and ink pad (I think we got our stamps at WalMart for pretty cheap.) Paint the child’s hand green and arm brown, have them spread their fingers wide and press down onto the cardstock. Use some brown thumb prints for coconuts, and the alphabet stamps and ink pad to make the letters climb up the tree. In another activity, we combined fine motor skills and math and came up with coconut counting. Basically, I printed out cards with empty coconut trees and a number in the top corner. The kids had to cut out the correct number of coconuts and glue them onto the tree. I was a little over ambitious our first go around and made cards numbered 0-20, but I think 0-10 would have been more appropriate for the attention spans I was working with. They can count to 20, but cutting out 20 coconuts was an entirely different story. Live and learn, right? Our last activity was everyone’s favorite by far, probably because it was edible. Using 4 apple slices, 1 Pepperidge Farm Pirouette stick, 3 pieces of coco puffs cereal, and a handful of alphabet cereal, we made our own chicka trees. They didn’t last long, but they sure were cute.